It would be the first opening bridge to be built on the River Thames since Tower Bridge in 1894 and the first dedicated pedestrian and cycle bridge to cross the river. 24 November 2015 – Plans to build a new bridge across the River Thames between Canary Wharf and Rotherhithe have taken another step forward following the completion of a detailed feasibility study. The study was commissioned by the cycling charity Sustrans in June 2015 after the Government signalled its interest in the proposed crossing in its National Infrastructure Plan (Dec 2014). Undertaken by reForm Architects and Elliott Wood engineers with cost management advice from Arup, the feasibility study has concluded that an opening pedestrian and cycle bridge is deliverable in East London. The preferred location has been identified as between Durand’s Wharf in Rotherhithe to the Impounding Lock in Canary Wharf. A crossing over the River Thames in this location has been considered before but never to the level of detail contained within this new feasibility study, in which the reForm team has conceived a concept design to test how a bridge would have to operate between the two landing sites to maintain a safe, navigable route for boats using the River Thames. To overcome the numerous technical challenges involved, the reForm team has developed a unique design that would have the largest span for an opening ‘bascule’ bridge in the world. 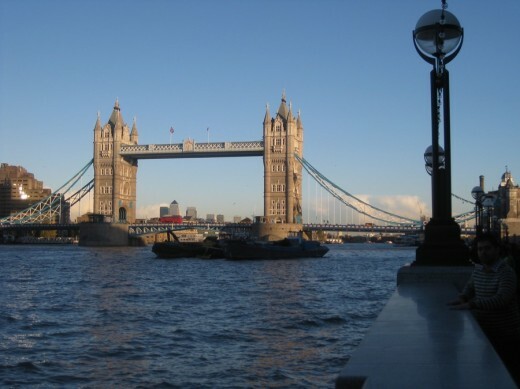 It would be the first opening bridge to be built on the River Thames since Tower Bridge in 1894 and the first dedicated pedestrian and cycle bridge to cross the river. 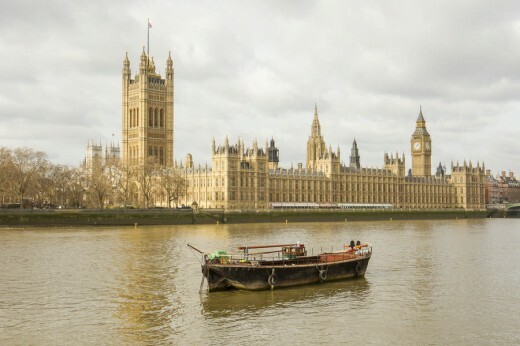 The design has been prepared in consultation with Transport for London, London Underground, the Port of London Authority and the Canal & River Trust. The feasibility study has been produced in response to significant demand in south-east London for a pedestrian and cycling link to the north of the city, which would serve to cut commuting times and congestion on other parts of the transport network and reduce pollution. People working at Canary Wharf and travelling by bike or foot from the south will no longer be faced by lengthy detours to Tower Bridge and Greenwich Foot Tunnel or the undesirable passage presented by the Rotherhithe Tunnel. Analysis undertaken by Sustrans predicts that by 2020 there would be approximately 2.1 million bicycle journeys each year or 10,500 per day across the bridge and more than 1 million by foot. The new bridge would also mean that the people of Rotherhithe would be linked to the Jubilee Line, the DLR and Crossrail currently under construction. A bridge linking the London Borough of Southwark to Canary Wharf has the potential to deliver significant economic benefits for both areas and support their continued redevelopment and regeneration in response to population growth. The bridge would have a central span of 184m, opening to create a completely unobstructed opening of unlimited height for the largest vessels. Ramps would rise from each bank and cross the water’s edge to form an approach to the opening section of the bridge with two 5m wide decks continuing either side of the main cantilevered ‘arms’, providing continuous separate routes for pedestrians and cyclists. 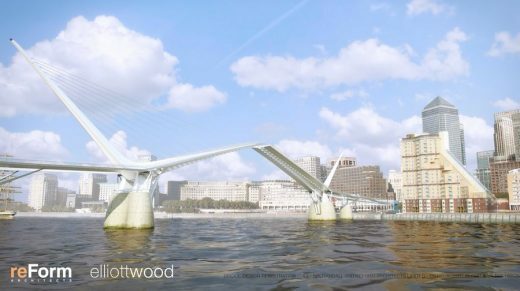 The bridge has been engineered by London based structural engineers Elliott Wood to meet dynamic performance criteria and ensure that the energy required to lift the bridge is minimised. It is estimated that the construction would be approximately £88m and take 4-5 years for the bridge to be built, although the total project cost would be higher. The next step for the project includes securing financial and political backing to continue testing and developing the design. “Our work has demonstrated that whilst other opening bridge types present problems for this location, it is possible to design a bridge that meets these challenges with an elegant, welcoming and unique structure. 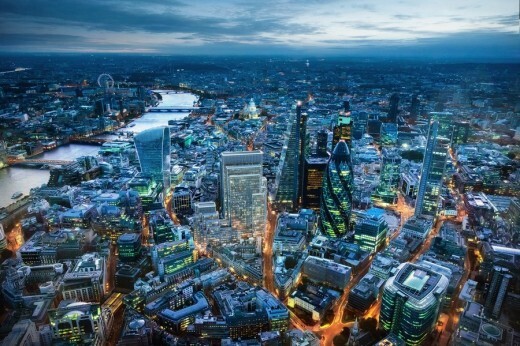 The River Thames is one of the world’s great rivers, and London is one of the world’s great cities. Any new bridge across the River Thames must respond to the significance of its setting, and add to its culture and heritage.